You are here: Home › Cover Crop Benefits › Water infiltration/percolation › Cover Crops effect on spring Soil temperatures › Cover Crop Challenges › Misinformation and Myths › Part 3- Do Cover Crops Keep the Soil Colder in the Spring? As of today (April 17, 2013) there is 0% corn planted in Iowa and Indiana with 1% in Illinois and Ohio. It is now wet and cold…not just cold. As my brother Don takes soil temperature readings in no-till soils with cover crops, no-till with out cover crops, and fall tilled soils, we are trying to get an idea if no-till soils and or no-till soils with cover crops keep the soil colder than fall tilled soils. These trials are being conducted in central Indiana and should be a pretty good measurement for much of the Eastern Corn Belt. I am in northern Wisconsin today where there are snow covered fields with 6-8″ more snow coming in the next 36 hours. The readings from central Indiana don’t mean much in Minnesota and Wisconsin…but, I believe they are still instructive. The temperatures at the local weather station showed that the actual average high for the week was 70.6° (historic average is 61°) and the actual nighttime average was 49.9° (historic average is 40.3°). This was the first week in the past several weeks that have been warmer than average. There was nearly 1 inch of rain during the week. 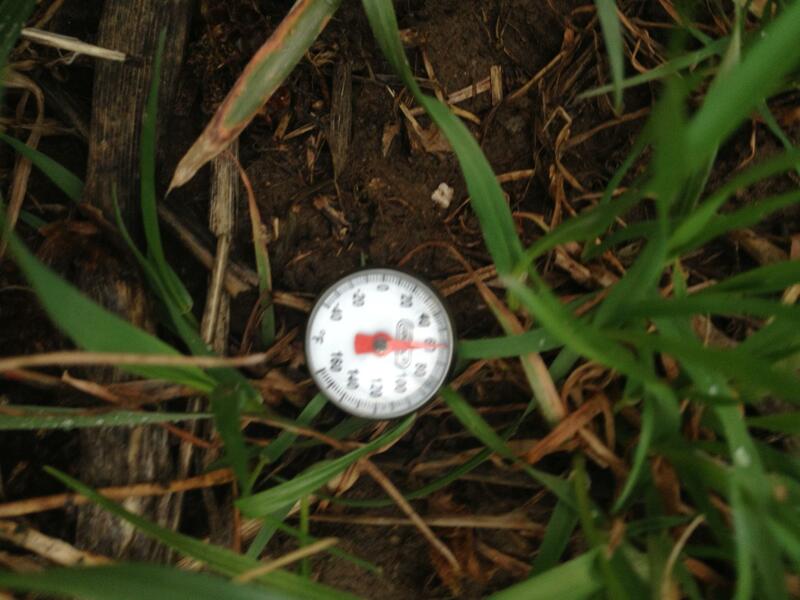 Warm weather really helped increase the soil temperature, almost 10° in some of our trials. It is interesting to see that the no-till soil without a cover crop was the coolest by 1°. It was also the wettest soil last week and certainly appears to be the same on 4-12. The warmest soil was the no-till with cover crop. 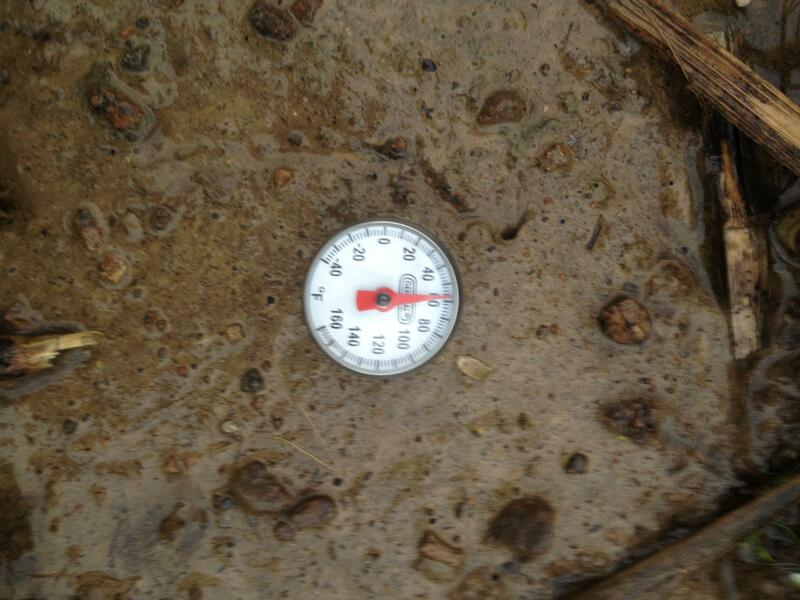 Not by much but it is warmer than the fall tilled soil by ~0.5°. With heavy rains in the area this week it will be interesting to see what happens in each soil. We hope to get an idea of what kind of earthworm activity we can find, but that might be difficult in the muddy sites. 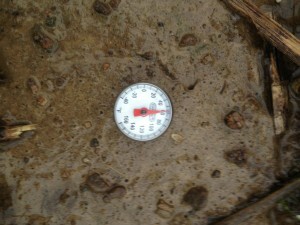 As you look at the photos notice the moisture content on the surface of the soil. There are two observations or reminders that we should consider. When we took compaction readings last summer (2012) we saw a significant benefit where we had cover crops compared to the no cover crop check. These soil temperature tests are taken from those same plots. Another observation is that I have found improved aeration and percolation where we have had cover crops (long-term no-till with cover crop) verses long-term no-till without a cover crops and a spring tilled soil. I believe we are seeing that the cover crop is giving benefit again this spring in these areas. What are you finding on your farm? 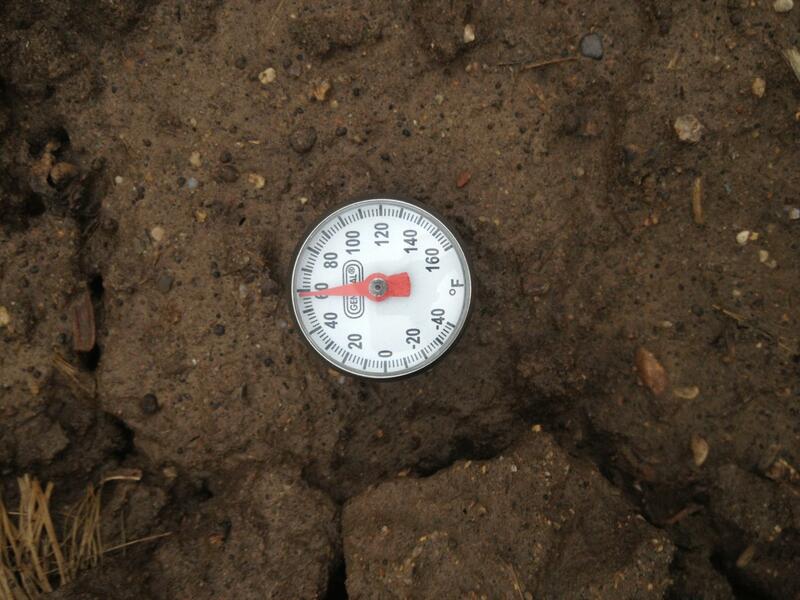 The soil temperature in the long-term no-till soils on 4-12-2013. Note how waterlogged the soil looks. 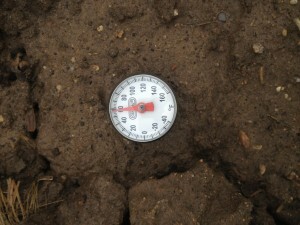 The soil temperature in the long-term no-till soil with a cover crop. Note that the soil looks drier and it is also the warmest reading this week. 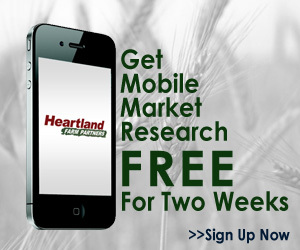 ← Part 2- Do Cover Crops Keep the Soil Colder in the Spring? One Response to Part 3- Do Cover Crops Keep the Soil Colder in the Spring? Dave, I dont think we need to be worried about soil temperature. What farmers are doing to increase soil temperature in the spring is hurting later on(such as tillage to do away with organic matter.) You would think with the recent droughts guys would try to increase organic matter for water holding capacity even if it pushed planting back a week in the spring not to mention the other soil benefits cover crop organic matter has for the soil. Another example of conventional agricultures failure to look at the year around big picture.